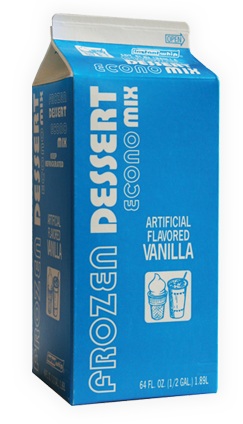 Econo Frozen Dessert Mix | Instantwhip Foods, Inc. This delicious, quality dessert mix was originally created especially for shakes, but thanks to its popularity and the inventiveness of our clients, it is now used on dessert buffets, cones and sundaes – and in newly-popular cocktail recipes as well. That’s one of the advantages of working with the INSTANTWHIP® family of products – we focus on delivering traditional tastes that today’s creative chefs can use in endlessly modern ways. INSTANTWHIP® ECONO FROZEN DESSERT MIX performs exceptionally well at normal overrun. It’s the ideal product for the cost and quality conscious operator. Ordering INSTANTWHIP® ECONO FROZEN DESSERT MIX couldn’t be easier- whether it’s from your local Route Sales Team, online or with a phone call. How about one of these flavors in a sundae, cone or shake? Chocolate? Of course – but how about Dark Chocolate and Cherry? Strawberry? Naturally – but how about Strawberry-Rhubarb? Cookie or Candy Shakes? Just pick your favorites. More sophisticated tastes? How about Honey Lavender or Salted Caramel? Walk on the wild side? Pick any combination of spicy and sweet. Frozen: 1 year. Once thawed, keep refrigerated at 35ºF for up to 3 weeks.